Apparently, based on my blog comments about the Race for the Cure you all hate supporting cancer causes. I'm teasing... 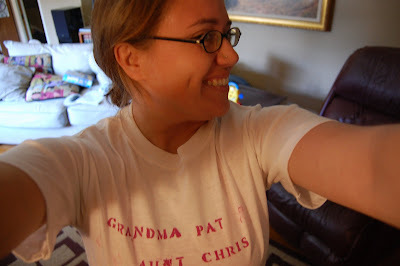 I got quite a few names from the blog, emails, twitter and Book of the Face from those who felt comfortable sharing. I stenciled it myself (what you can't tell?!?! HA.) Definitely NOT professional but that's not the point. This is Jaime and her daughter, Sadie Kate. Jaime lost her mom to breast cancer when she was an itty bitty infant. 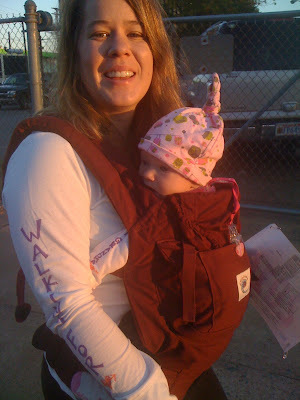 Jaime was breastfeeding Sadie in her carrier as we walked across the starting line which was amazing. Here is an image I snapped with my iPhone but it doesn't really do the sheer NUMBER OF PEOPLE justice. (Yes, those are ALL women as far as you can see!) 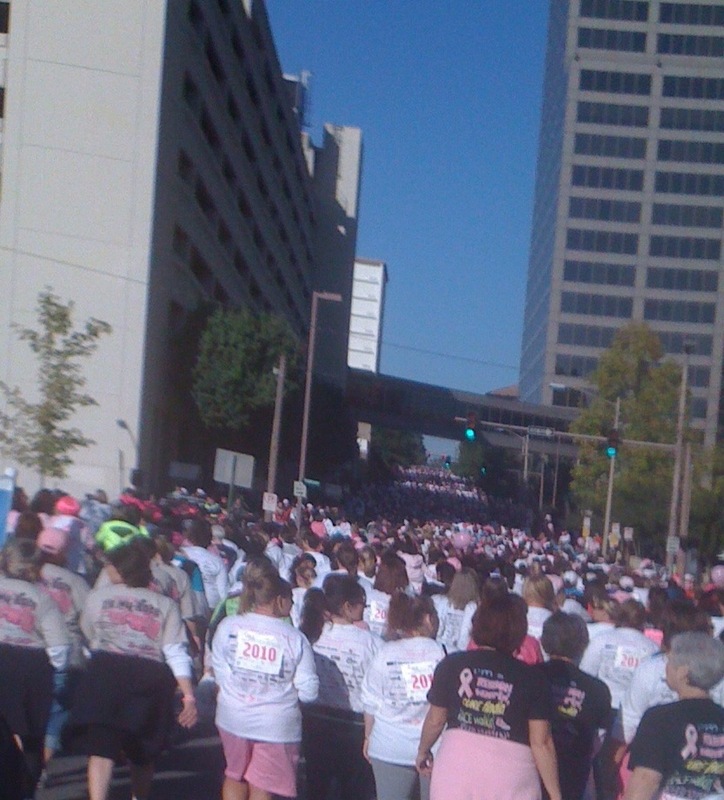 I think the final number wound up being 45,000 to 50,000 participants. I was attempting to find an online local news coverage to link to but the newspaper you have to pay for the full article and the news stations don't seem to have updated info or pictures online yet. So you get my crappy iPhone pictures instead! There were A LOT of strollers. 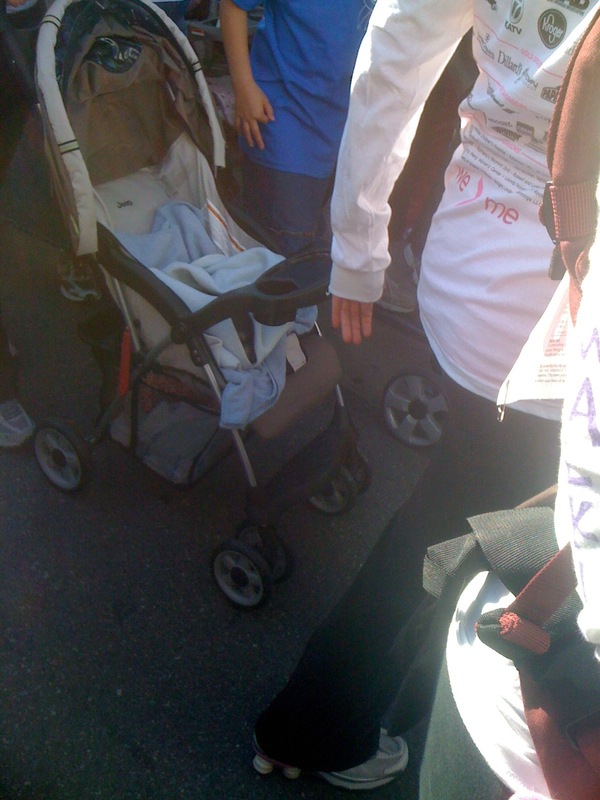 I don't know how or why you would push a stroller in a crowd of 50K all packed in but people did. This woman decided her dog needed its own (seriously this whole dogs in strollers thing has GOT to stop. OR someone at least needs to create a website dedicated to making fun of the phenomenon. ): After the race we headed to The House b/c they were donating 10% of brunch profits to the Foundation. I'm no foodie but THIS THING (the B.A.T.M.A.N.) was amazing. Bacon Avocado Tomato and some herb-mayo slathered on wheat toast. I added an egg over easy per our waiter's suggestion (nice and runny) and almost died from the deliciousness. For real. 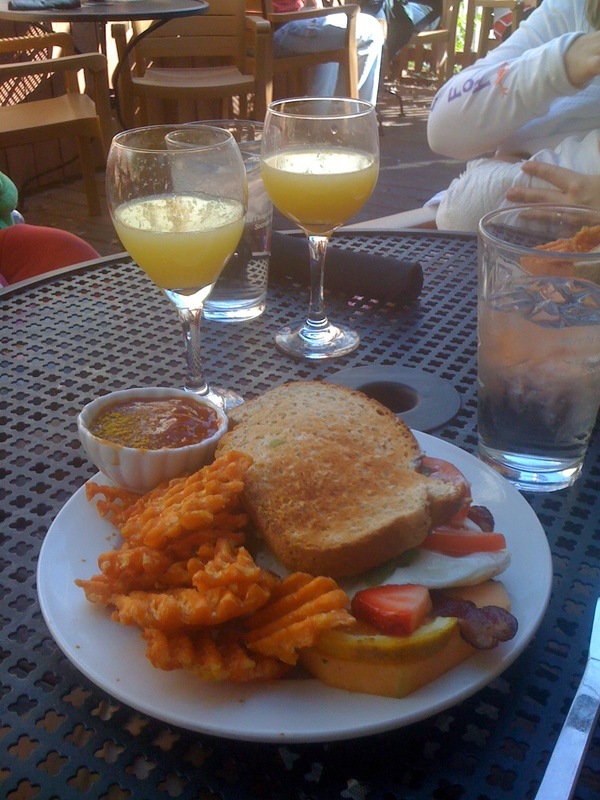 Little Rock is stepping up its brunch game. 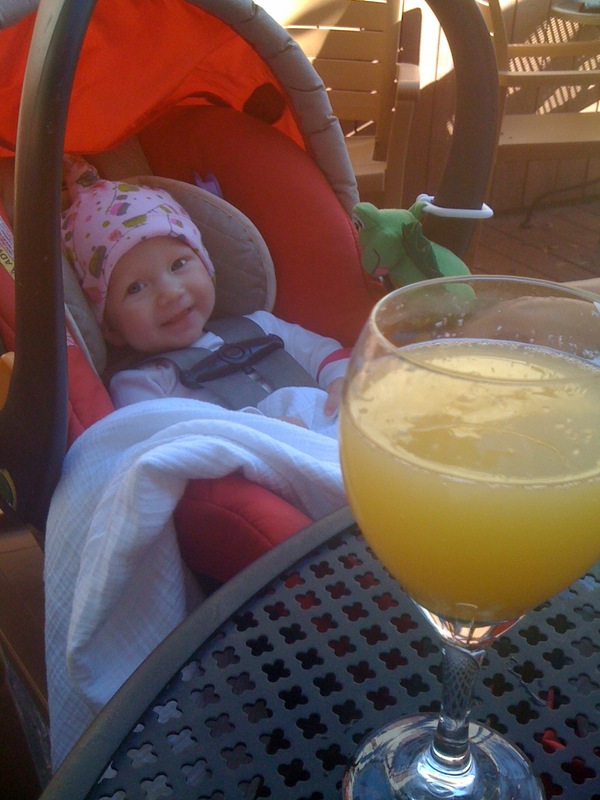 We also had some mimosas which Sadie Kate seemed to find highly entertaining. So that's it. Thank you to everyone who shared names for the shirt. It was an emotional day and event. I can't wait to do it again next year! good work, boss! big kisses to jamie and sadie. oh, additionally, next time i'm in lr i want the blt with the egg. mother f that sounds amazing. K, you're so freakin cool. 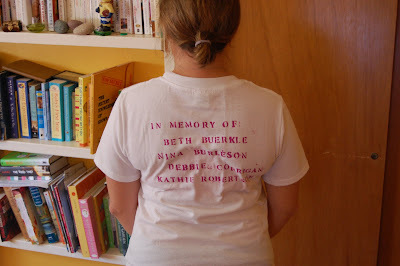 I love that you did this, and I know it meant a lot to other folks, too. Rock, sister. Rock. That sandwich looks AMAZING! Are those sweet potato waffle fries that come with it? Because I may have to make a trip to Little Rock just for that. I wish I would've signed up this year. 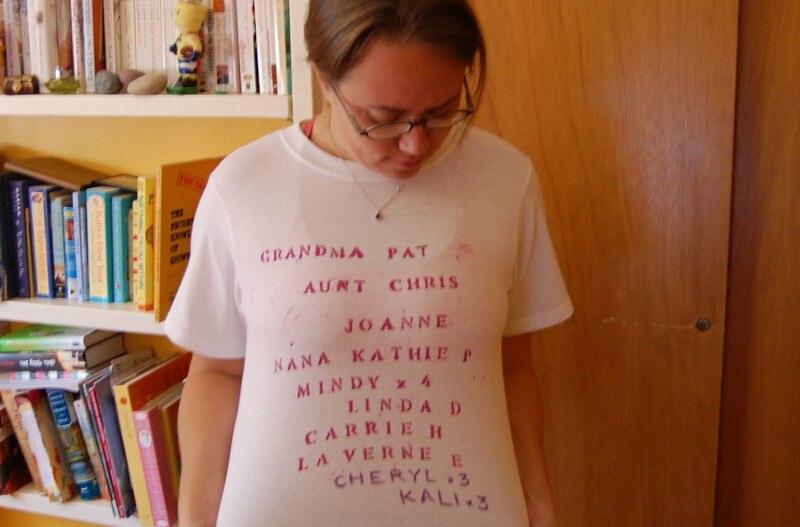 Thanks for putting my aunt Nina on your shirt!